Fancy-pants recording studios are great if you can afford them, but there is another way. It’s now possible to make music using nothing but your mobile phone. The future of recording studios and the people who weave their magic in them – the producers and engineers ensuring albums and singles sound just right – are safe for the foreseeable future. But they face stiff competition. Mobile phone music technology apps are evolving at lightning-fast speed. To confirm this, last year it was revealed that Steve Lacy, one of the producers on Kendrick Lamar’s new album Damn, made the track Pride using just his guitar and an iPhone. Producing music on your iPhones is simple, fast, easy and convenient and there are apps out there to help seasoned music creators and beginner bedroom producers alike! Chord Progression Generator is music making app created and developed for iOS devices. 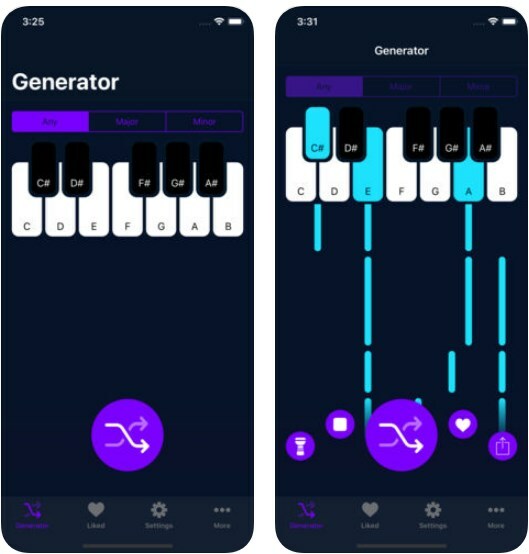 This is an app that will help it users discover and create chord progressions and melodies they can incorporate in their music projects with ease. The app comes with many features like: adjusting the bpm, choosing certain instrument, activating rhythm, piano rolls, auto-playing, loop mode, bassline creation and many more. The app is based on music theory but don’t need to be especially knowledgeable to be able to create awesome music with the Chord Progression Generator app. Creating and composing your first chord progression with the app is possible with only one tap. You’ll find that creating great music with the Chord Progression Generator app is really approachable and not at all daunting task. Any of your created chord progressions and melodies can be saved and downloaded as midi files. This means you can later use them with your favorite DAW program to incorporate them in your music projects. Your chord progression and melodies will be downloaded in three files, one with only the chords, one with only the bassline and one with both together, making it easier to use them for arrangement and sound design. The Chord Progression Generator can be downloaded for free at the iTunes App Store.